LeBlanc addressed the Faculty Senate on Friday to talk about his plans for the university going forward. 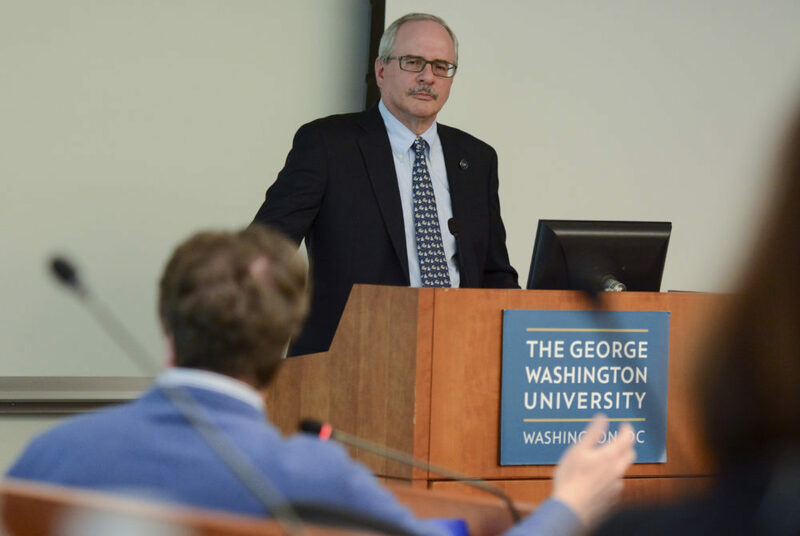 At his first Faculty Senate meeting since starting his tenure at GW, University President Thomas LeBlanc pledged his support for faculty governance and urged faculty to embrace his University-wide priorities. In a long and candid address to the Faculty Senate, LeBlanc suggested some at the University were skeptical of the University’s research efforts, said GW doesn’t raise money at the rate of its competitors and reiterated his contention that the University was excessively bureaucratic and worried about its finances. LeBlanc outlined his goals for the University during his remarks, which included improving the undergraduate student experience and leading a culture change in how officials make decisions. LeBlanc said improving the University’s research offerings across fields, including for science and engineering, would continue to be a major focus of his tenure. “If universities don’t aspire they should close up shop,” he said. “Today if we’re thinking about a university of this stature that isn’t either seeking or achieving preeminence with science and engineering, it would just be wrong. Along with further prioritizing research, LeBlanc said that he wanted to focus on changing the culture of the university to be less focused on finances and place a greater emphasis on achieving important goals. Going forward, LeBlanc said that resources should become more user-friendly both for administrators and for students. He said his perspective as a life-long academic would inform his decisions as university president. Nelson Carbonell, the chairman of the Board of Trustees, also addressed the Faculty Senate Friday, laying out his plans to increase transparency and convene two task forces centered around the undergraduate student experience and alumni engagement. In at times tense exchanges with faculty, Carbonell defended the Board from charges that it was overly involved in the day-to-day running of the University, a persistent complaint among faculty. Harald Griesshammer, an associate professor of physics, said part of the University’s cultural issues stemmed from a disconnect between officials and faculty and the goals of the Board of Trustees. Carbonell said the Board would support LeBlanc’s mission for the University, but told the Faculty Senate that the Board was ultimately the highest decision-making body.